L F (Lynette) McDermott, Promise of Tomorrow, Book 3 of the Garth Trilogy, Lynette McDermott, Sydney, 2018, ISBN: 978-0- 9946057-2-6, $30.00 plus $8.00 postage within Australia, 462pp, paperback and ebook also available. The Garth Trilogy is a series of historical novels which tell the story of two First Fleet convict families, the Garths and the Belletts, first transported to Sydney then to Norfolk Island and finally to Van Diemen’s Land (Tasmania) when the convict settlement on Norfolk Island closed. The first novel in the series, Of Angels and Eagles, looked at their convictions and their time on Norfolk Island. Perseverance is the second volume and takes up the story after the two families resettled in Tasmania. The third volume in the Trilogy, The Promise of Tomorrow, is the story of Edward Garth and his wife Sarah and their children, especially their daughter Lil. Edward has wandering feet and a desire to do all kinds of things and we follow the family from Tasmania to the Gippsland Lakes of Victoria, to Newcastle, Wyalong and other New South Wales mining towns, and finally to Sydney where Lil and her sister Louisa settle. It could also be the story of many other families who travelled around looking for somewhere to call home and to find their fortune on a mining field. As were the times, men made the decisions and the women followed and we can feel for Sarah as she thinks what it would be like to have a permanent home. Her children are all born in different places and tragically some die and they are left behind when the family moves on. Edward and Sarah had their love and respect for each other and together they made the most of their lives and raised their children to carry on family traditions. The second part of The Promise of Tomorrow is Lil’s story and we follow through her early love, her sad, lonely and tragic marriage and her desire to still provide the absolute best that she could for her children. Like her mother, Lil knew the heartbreak of losing her children in different places. Still looking for love she has an affair and more children, and her first love appears throughout at brief moments. World War One impacted on everyone but we see it through Lil’s eyes and the changes it brought to Sydney and all those who lost family. A letter from Europe at the end of the war suggests her first love is coming home to her but after a few years, Lil realised that he may not have made it after all. It is not until the very end that we learn what happened and discover the meaning behind The Promise of Tomorrow. As with the first two books, I really enjoyed reading this fictional account of the Garth family which is based on the real Garth family. The author is the great granddaughter of Lil Garth. There is a family tree at the beginning so that you can easily see the Garth relationships mentioned in the book. 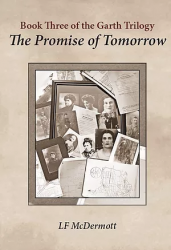 The Promise of Tomorrow is a standalone novel, but I had already read the first two books and was aware of the major characters and their history. If you really want to experience a family story over several generations then my suggestion would be to read each of the three books in order. The books are for sale from the author’s website www.lfmcdermottauthor.com or they may also be available in your local library. Anyone with early families in New South Wales, Norfolk Island, Tasmania and Victoria will find these historical novels an interesting and easy read. The books will leave you thinking about what it was like for your own families to start new lives in a strange land. More information is available on Lynette McDermott’s website.